Yesterday’s press announced that Mikhail Mokretsov, ex-Director of the Federal Tax Service (FNS) and long-time colleague of Anatoliy Serdyukov, will be the Defense Minister’s Apparat Chief. Kommersant says Serdyukov had largely kept his old team in place, and still influenced personnel decisions in the Finance Ministry’s FNS. And the FNS has been a stable supplier of high-level cadres for Serdyukov’s Defense Ministry. Along with ex-deputy directors of the FNS Dmitriy Chushkin and Yevgeniy Vechko, not less than 10 other highly placed former tax service officials have come over to Serdyukov’s Defense Ministry. Kommersant indicates this may represent the end of Serdyukov’s ‘agreement’ with Finance Minister Kudrin to leave his old cronies in place in the FNS for three years. Perhaps playing the provocateur, Gzt.ru suggests that some in the Genshtab see Mokretsov’s arrival as a precursor to Serdyukov’s departure from the Defense Ministry. Under this scenario, Serdyukov would be preparing Mokretsov to take his place as Defense Minister when he moves to a higher post. But a PA source denied any prospect for a change of Defense Minister and specifically ruled out Mokretsov’s chances. Mokretsov will occupy a long-vacant post. Its last occupant, Andrey Chobotov left with former Defense Minister Sergey Ivanov when he became Deputy Prime Minister. Chobotov apparently works in Ivanov’s office and in the government’s Military-Industrial Commission (VPK). Since Chobotov had the job, the apparat has been considered a Defense Ministry ‘service’ [not to be confused with an armed service] and this brings its chief the title of Deputy Defense Minister. According to Gzt.ru, retired General-Lieutenant Andrey Kazakov has been the acting apparat chief since Chobotov’s departure. Kazakov has served in the Defense Minister’s apparat, primarily as Chief of the Defense Ministry’s Affairs Directorate, since at least 2001. The apparat chief wields serious power–at least within the administrative system. According to Gzt.ru, he is not simply the Defense Minister’s right hand. He’s a chief of staff and critical gatekeeper whose agreement is necessary to get documents signed and decisions made. This power is largely unofficial, deriving from personal proximity to the Defense Minister. The apparat chief’s official, statutory powers are more modest. Mil.ru lists six official elements under him. The Expert Center of the RF Defense Minister’s Apparat is something of a ‘think tank’ preparing analytical information and reports on military-technical policy, force structure, and force development, under the Defense Minister’s direction. The Main Legal Directorate of the RF Defense Ministry has been reinvigorated of late, and its role is self-evident. The above-mentioned Affairs Directorate serves as property manager and business agent for the Defense Ministry in Moscow. The Directorate of State Assessment of the RF Defense Ministry is responsible for ensuring that military infrastructure complies with an array of government regulations. The apparat also includes, without explanation, Inspection of State Architectural-Construction Oversight and the Management Directorate of the RF Defense Ministry. Ivashov goes on to complain about Serdyukov’s commercialization of Defense Ministry functions, e.g. turning rear services into Oboronservis. Vitaliy Shlykov, who views Serdyukov favorably, sees the Mokretsov move as promoting creation of a civilian Defense Ministry that still doesn’t exist. And Shlykov doesn’t see Serdyukov leaving the Defense Ministry since it is, in many ways, a higher post than a deputy prime minister with a portfolio, who doesn’t really run anything. Today’s Vedomosti intimates that Mokretsov will focus on auditing the State Defense Order on the heels of Prime Minister Putin’s remarks this week about corruption, waste, and poor results in the OPK . More about Mokretsov specifically . . . 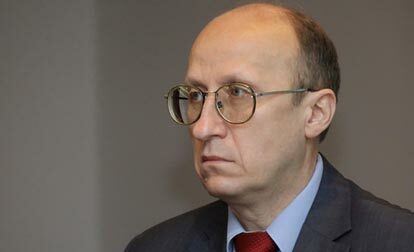 He joined the tax service in 2000, moving quickly from department chief to deputy director of the Tax Ministry’s Directorate for St. Petersburg, deputy director of the Directorate for Moscow, and Chief of the Directorate for International Tax Relations. In 2004, he became deputy director of the renamed Federal Tax Service under Serdyukov, and Director of the FNS in February 2007 when Serdyukov left for the Defense Ministry. The 49-year-old Mokretsov was born in Udmurtiya, and graduated in 1984 from the Leningrad Financial-Economic Institute. He was called up after graduation and served two years as a finance officer in the Soviet Army. Between 1986 and 2000, he worked in unnamed government and commercial enterprises in St. Petersburg. This entry was posted in Command and Control, Crime and Corruption, Military Leadership, Serdyukov's Reforms and tagged Anatoliy Serdyukov, Andrey Chobotov, Genshtab, Leonid Ivashov, Mikhail Mokretsov, Oboronservis, PA, Sergey Ivanov, Vitaliy Shlykov, VPK. Bookmark the permalink.